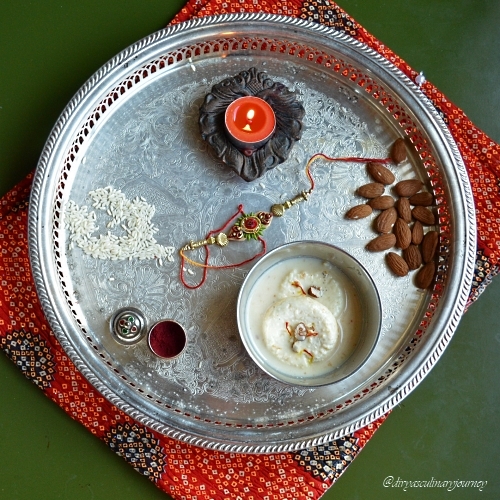 Today being Rakshabandhan, wanted to make something special for the day. I am too sentimental about this particular festival as it is all about the bond between a brother and sister. Me and my brother share such wonderful bond. But it is more than 4 years since I met him and especially today I missed him a lot. I felt a little better after having video chat with him in the morning. I hope atleast next year, he is with me so that I can tie rakhi in his hand. But we have the next generation, sister and brother at home, my kids and this is their 2nd Rakshabandhan. 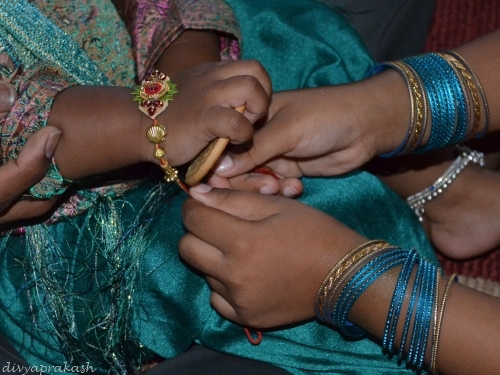 My daughter was all excited to tie rakhi to her brother. But the little one, if he understood anything, I don't know. It was really nice to see the kids follow all this. On this special day, would like to wish you all, HAPPY RAKSHABANDHAN!! 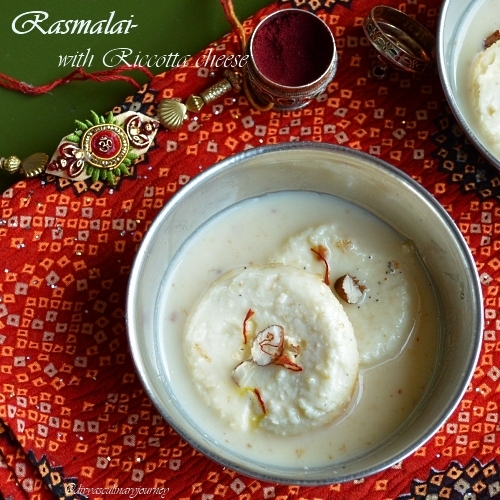 The special dish I chose to make is Rasmalai with ricotta cheese. It was pretty easy to make and tasted very close to the authentic version. This is sure to impress anyone, you serve this dessert. Powder 1/4 cup of sugar and 2 cardamom and mix them with ricotta cheese. In a muffin pan, equally divide this mixture and bake for 40- 45 minutes until it is set. The tooth pick inserted comes out clean. Let them cool completely, before removing from the muffin pan. In a sauce pan, boil the milk and add the condensed milk, sugar and simmer in low flame till it reaches the desired consistency. Powder a tablespoon of sugar with 3 cardamoms. and add to this mixture mix well and add the pinch of saffron and mix well and keep it aside to cool down. Once it reaches the room temperature add the ricotta pieces and let it soak for at least an hour. I prefer to serve it chilled. So left it in the refrigerator until ready to serve. While powdering the cardamom, remove the outer skin and use only the seeds. The skin doesn't grind well and if you get a bite of that in a dessert, it's definitely a turn off. If there are any excess water in the ricotta remove them, before starting the process. I used 2 spoonful for each muffin cup and it yielded 12 ricotta balls. Take care not to burn the ricotta while baking, depending on how much cheese in each pan and the oven the timing varies, so keep a close watch. Let the ricotta discs cool completely before removing from the pan, it will break when it is hot. Also the syrup has to be in room temperature. The cute hands look so pretty with the rakhi Divya. Hope the kids enjoyed the rasmalai as well. Loved the first pic a lot, I assume they are your kids. Rasmalai loves awesome Divya! Thank you for visiting my blog Divya, you have a lovely space here! Love the rasmalai, they are perfectly made! 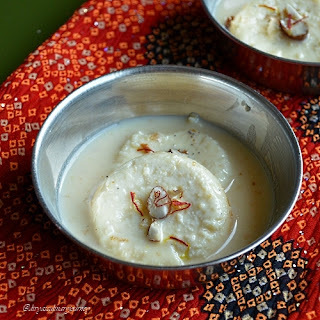 Irresistible rasmalai with ricotta cheese, prefect sweet for this celebration. Tempting Rasmalai.Iam sure your little ones loved this. Is it Sweetened Condensed Milk or unsweetened? 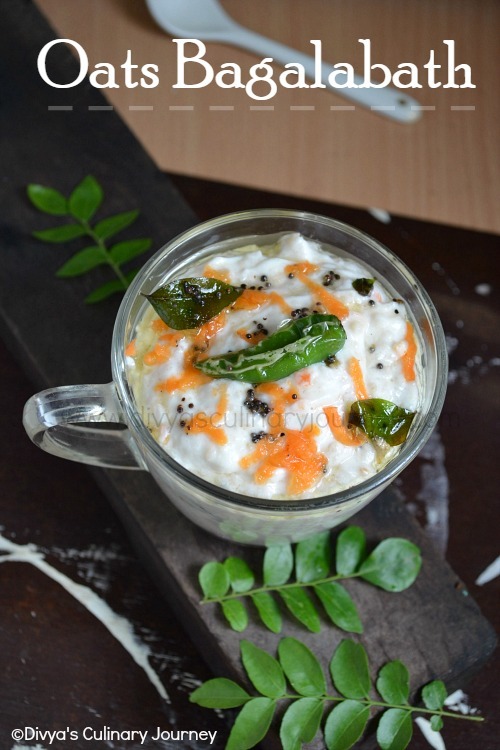 Divya, have you tried other paneer based deserts with Ricotta cheese? Thank you for the amazing dish! It turned out yumm..! I tried spraying cooking spray before on the pan to avoid cheese from sticking. Also, I reduced sugar by 1/2, thats just my opinion to cut down on cal..